Holiday Gift Hams GTA | Gifts | The Honey Glazed Ham Co. Ltd. Delicious Holiday Gift Hams from GTA’s The Honey Glazed Ham Co. Ltd.
For the holidays, what better way to spread good cheer than savoury holiday gift hams in GTA? 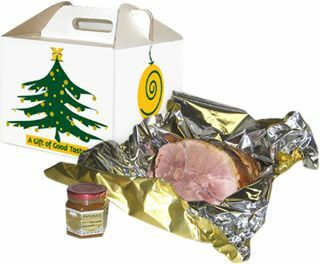 Give the foodies in your life a delicious spiral sliced honey glazed ham with tasty honeycup mustard, all packed in a festive gift box. Or try a smoked turkey with cranberry sauce. We also offer excellent corporate gifts (you’ll get rave reviews! ), and make gift-giving even easier with our gift certificates. Call Todd for a quantity discount price! Or you can simply treat a friend to one of our mouth-watering lunches. The Honey Glazed Ham Co. Ltd.